The purpose of this guide is to give a general understanding of Cryomanser class, how to play and what can you expect from Cryo. “If fire is the creative energy of the world that shapes the future, then cold is its memory, the unchangeable past. Cold is primordial and infinite, and therefore invincible. It is an inexhaustible source of power, and there is nothing surprising in the fact that many of the immortals are turning to it to achieve their goals.” – Asterius’s Encyclopedia. Cryomancer is one of three starting classes: easy to play and able to deal serious damage. This is one of the most mobile classes in the Game. On the other side, Cryo has adequate defense and substantial controlling abilities. Mobility and defense allow surviving in the battle and avoiding close contact with enemies. It makes Cryomancer suitable for both, PvE and PvP. Most of the Cryo’s damage is uniformly distributed along the battle, practically – there is no “burst” ability, at least in serious PvE. In doesn’t make Cryo unplayable, but most likely during any serious raid you will be asked to change the class. At least in our Pantheon, when we are discussing required classes for raid, Cryomancer is referred as “surprising-class”. It means, that raid has enough damage, you will not be buffed or protected, and no significant damage is expected from you. Similar to all other classes, Cryo has its class-specific resource: Cryogen. The amount of Cryogen is displayed as purple bar below your heath-bar, maximum amount – 300. Cryogen is used for powerful attacks, and normally regenerated with the speed of 15 Crgn/sec. Cryo has 18 attack and defense abilities, and 20 talents. Any given moment of time, up to 13 abilities can be used and up to 8 talents can be active. Below is detailed description of all skills, if you know everything – you can skip this part. Cryonic Pulse – Left Click (LC), has two charge levels. Shattered Storm: Inflicts 0.45x base damage to the target. Range is 30 yards. Freezing Gale: Deals 0.65x base damage to the target and all enemies in a 10 yard radius of the target. Activates Impulse Charge. Icy Missile – Right Click (RC), has two charge levels. Activates Impulse Charge. The range is 30 yards. Consumes 50 Cryogen. Icy Thorn: Inflicts 1.7x base damage to the enemy. Range is 30 yards. This is your main attack skill. Icy Dart: Inflicts 1.7x base damage to the target, as well as 0.1x base damage every second for 10 seconds. Glacial Fangs – “1”. Instant, 30 sec cooldown, consumes 90 Cryogen. Inflicts 1.05x base damage to all enemies in a cone-shaped area in front of the character and applies Cryonic Suspension to them for 2.5 seconds, completely immobilizing and silencing them. Icy Beam – “2”. Instant, 20 sec cooldown, consumes 110 Cryogen. Inflicts 1.34x base damage and applies Cryonic Suspension, immobilizing and silencing the target for 2 seconds. The range is 30 yards. Snowball – “3”. Instant, 32 sec cooldown, consumes 150 Cryogen. Creates a snowball that knocks down the enemies and takes them with it as it rolls along. Inflicts 1.03x base damage. The snowball rolls 15 yards in a straight line. When it breaks apart, it throws the enemies away, stunning them for 1 second. Ice Statue – “4”. Instant, 35 sec cooldown, consumes 150 Cryogen. Creates an Ice Statue with HP equal to 35% of your health. The statue attracts the enemies that were near it when it was created. All targets within a 5.5 yard radius around the Ice Statue are affected by Intense Cooling that reduces their movement speed. Once the maximum number of effects have been stacked. Icebound is applied which immobilizes the targets. The statue exists for 10 seconds. If used again, it destroys the statue, dealing 1.03x base damage to nearby enemies and applying Cryonic Suspension for 2.5 seconds, immobilizing and silencing them. Crystal Shield – “4”. Instant, 30 sec cooldown, consumes 60 Cryogen. Creates a shield that absorbs 60% of damage for 6 seconds. All targets in a 5 yard radius are affected by Intense Cooling that reduces their movement speed. Once the maximum number of effects have been stacked, Icebound is applied which immobilizes the targets. Cryobeam – “Z”. Instant, 15 sec cooldown, consumes 25 Cryogen. Inflicts 1.15x base damage to all enemies in the line of movement. The range is 30 yards. a. Note: also deals damage to enemies close to the target, approximately 1-2 yards. Cryotrap – “Z”. Instant, 30 sec cooldown, consumes 110 Cryogen. Creates an 8 yard radius area on the ground that makes the enemies slip and slide towards center. When used again, it explodes and deal 0.84x base damage. Lasts 10 sec. Stasis – “V”. Instant, 40 sec cooldown. Freezes the target, immobilizing and silencing it for 5 seconds. The target is immune to incoming damage for the duration. Jagged Ice – “V”. Instant, 25 sec cooldown, long press. Deals damage 1.68x base damage to the target every second during 5 sec (until you holding a key). Cryogen doesn’t regenerate during this time. Snowstorm – “C”. Instant, 55 sec cooldown, consumes 170 Cryogen. Creates a 12 yard radius area. All enemies that enter the area receive 0.24x base damage every second. Lasts 10 seconds. Every 3 seconds Intense Cooling is applied that reduces their movement speed. Once the maximum number of effects have been stacked, Cryonic Suspension is activated that immobilizes and silences the targets. Whiteout – “C”. Instant, 45 sec cooldown, consumes 170 Cryogen. Creates a 12 yard radius area. All enemies that enter the area take 0.55x base damage every second. Lasts 10 seconds. Every 3 seconds Intense Cooling is applied that reduces their movement speed. Frost Shackles – “R”. Ultimate class ability, 9:00 minutes cooldown. Applies Cryonic Suspension to all enemies within a 16 yard radius, immobilizing and silencing them for 6 seconds. Deals 4.8x base damage when the effect runs out. The stronger the enemy, the shorter the duration of the effect. Nice skill, but too long cooldown time. Northern Breeze – “E”. Fatality, Instant (should be), 20 sec cooldown. Can be used if target has little health left. Kills target and regenerates 75 Cryogen. Avalanche – Icy Comet deals 25% more damage and consumes 40 less points of Cryogen. Blizzard – Freezing Gale deals 35% more damage. Gust – The ranges of Icy Beam, Cryonic Pulse and Icy Missile are increased by 10 yards at all charge levels. Cryocharge – Cryobeam can consume two times more Cryogen to inflict 3 times more damage. Supercooling – Targets that have the Icebound or Cryonic Suspension effects receive 15% more damage. Ice Mantle – Ice Statue has 100% more hit points and lasts 4 seconds longer. Cryonica – Stasis and Jagged Ice reduce the movement speed of the targets, eventually immobilizing them. The effect of Stasis is activated once the immobilizing effect has run out. Exhaustion – Cryonic Pulse‘s charge level I (Shattered Storm) and Fragments left behind by Icy Missile deal 110% more damage to targets with less than 50% health. Heart of Ice – Ice Statue consumes 50% less Cryogen. Intense Cooling on surrounding enemies stacks 50% faster. Icy Blade – Icy Missiles‘ charge levels I and II (Icy Thorn and Icy Dart) deal 200% more damage to targets that have Cryonic Suspension effect, removing it and knocking them down for 2 seconds. Slide – Cryomancer’s Dash becomes Slide, that allows them to move 15 yards in the direction of movement, leaving an icy trail behind. Intense Cooling is applied to any enemy that remains in the area of the trail, reducing their movement speed. Once the maximum number of effects have been stacked, the Icebound effect is applied which immobilizes the enemy Inflicts 2 damage every second. Each stack of Intense Cooling reduces the movement speed by additional 10%. Frostbite – The duration of Whiteout and Snowstorm is increased by 4 seconds. Intense Cooling is applied every 2 seconds. Shivers – The amount of damage absorbed by Crystal Shield is increased by 20%. Targets that enter the area of effect for the first time will have the Icebound effect applied to them which immobilizes them for 3 seconds. Master Freezer – Icy Beam cooldown is reduced by 5 seconds, and its Cryogen cost is reduced by 30. Northern Gift – All enemies affected by Cryotrap explosion will have Cryonic Suspension effect applied to them, which will immobilize and silence them for 2 seconds. Severe Frost – Duration of the Cryonic Suspension effect caused by Glacial Fangs is increased by 1.5 second. Slalom – Movement speed of allies affected by Cryotrap, Whiteout, Snowstorm, Ice Statue, Slide andFrost Shackles is increased by 30% for 5 seconds. They become immune to movement restricting and immobilizing effects. Hoarfrost – The range of Snowball is increased by 10 yards. Frost Rage – Damage dealt by Fragments left behind by Icy Missile‘s charge level II is increases by 200%. Cold Veil – Crystal Shield cooldown is reduced by 11 seconds. Choice of required Abilities and Talents. Let’s start with Abilities. We need to choose 5 from 10. Snowball vs. Icy Comet. Actually, I see no use for snowball at all. Choice: Icy Comet. Ice Statue (IS) vs. Crystal Shield (CS). One the one side, IS with appropriate talents it has 70% of your health and for lasting for 14 seconds. So, if mobs are attracted – you have 14-16 sec to kill them all. On the other side, IS consumes a lot of Cryogen, nearly the same amount as Whiteoutand has about the same cooldown time. Moreover, bosses and some mobs are immune. And IS is almost useless in PvP, while CS is always with you. Therefore my choice: Crystal Shield. Cryobeam (CB) vs. Cryotrap (CT). CB with Talents inflicts 3.45x base damage every 15 sec. Taking into account that it has low Cryogen consumption, and you will use weapon which increases damage of CB, the choice is obvious – use CB on cooldown. In general, CT could have use in PvP, but then you need CT-related secondary weapon. Which is not good in PvP – you need either Whiteout, or anticontrol offhand for PvP. Choice: Cryobeam. Stasis vs. Jagged Ice (JI). Let me think… JI does 8.4x base damage during that 5 sec. If you will use this time for regeneration, you will have Cryogen for 1.5 Icy Missile: 1.7×1.5x=2.55x base damage. Plus 5x Cryonic Pulse, +2.25x base damage. Even if you have Founder’s weapon (multiplier 1.54 for Icy Missiles), then is JI 35% better. Stasis is a control-class ability. I see limited use, may be if your party has low damage, but you want to pass group dungeons and need to control mobs for recovery… Or in PvP to stun someone, if he wants to escape (for example with your Flag). My Choice: Jagged Ice. Snowstorm (SS) vs. Whiteout (WO). WO does 2.3 times more damage. If you have offhand which increases WO damage, it is even bigger difference. The only advantage of SS is stun to enemies, but in my opinion that huge damage is much better. The total damage of WO over 10 seconds with “blue” offhand (+112%) will be 11.66x base damage. Choise: Whiteout. IC is not effective against single target. Use it against at least 2 targets. Most effective against packs. IC without Avalanche suitable against 4-packs. The choice of Abilities also defines the choice of Talents, but taking into account that we have just 8 slots for Talents, we need make several decisions. Decision between damage and survival, damage to bosses or big packs, PvP or PvE. Nevertheless, there are several nearly “must have” Talents for most of available activities. Frost Rage – solo/AOE damage. The rest is up to you and depends on the surroundings. Slide – to escape if something went wrong. Can be sacrificed, if you are sure in your skills. Can be replaces with Cold Veil. This choice is also good for some bosses, that calls for many (>2) adds. For example, final bosses at Factory 501 and Port Naori. Slide – to escape if something went wrong. Cold Veil – faster shield cooldown, “must have”. Now, what about PvP? The choice of skills for PvP is always subject of numerous discussions. Especially, if there are many suitable Talents. Therefore, there is no universal answer. Exact choice depends on many parameters. Is it 3×3, 10×10 or Lugran? If you are at 3×3, who are your enemies and allies? Can you keep distance with enemies or not? I prefer to sacrifice damage in favor of survivability and control, and therefore strike out some Talents in the list above. But remember, it is my choice :). Class development: what’s first in the Atlas. Now we should take a look as the Cryo’s Atlas and optimize out pathway. First of all, we need abovementioned PvE Abilities and Talents. Therefore, after passing Path of the Crymancer, our pathway will be as shown below. Follow the red arrows: Cryonica → Cryobeam → Frost Rage. Next, take the lower path: Cryocharge →Gust → Frost Shackles → Slide. If you want faster reach useful abilities, you can skip Slide. AfterSlide, once again two ways – both are not very critical. You can take any on them, I took lowerSupercooling. From Supercooling → Snowball → Crystal Shield. On the right from Snowball →Crystal Shield. Upright from Crystal Shield → Shivers → Frosbyte. After you unlocked all abovementioned abilities, you can continue in any direction. I would recommend to go upright from Snowball → Stasis → Master Freezer, and downright Snowball → Ice Mantle (pass through) → Icy Blade. To fully open class atlas after Path of the Crymance you will need 8380 Sparks of Could/Evolution. You can save approximately 500 Sparks if you will open only Ability/Talen nodes, and skip stats. After opening all Ability/Talen nodes, you will receive 2 slots for symbols and class costume. Choice of Abilities and Talents defines skill rotations. I suppose, that certain symbols are activated. At least “Gravitational Perturbation”, which gives +12% damage after Impulse charge. Freezing Gale: Impulse damage to the target and all enemies around, + activates “Gravitational Perturbation” – 12% damage up. If you have “Painful Spasms”, all mobs will also receive DoT. If some mobs still alive, and running to you: Crystal Shield → Freezing Gale (2-3 times, to kill weak but dangerous mobs) → Icy Thorn (for stronger) → Jagged Ice (if needed). Most likely, you don’t need WO for weak packs; they will be dead after Freezing Gale → Icy Comet →Cryobeam → Freezing Gale → Freezing Gale. Icy Thorn: Impulse damage, + activates “Gravitational Perturbation” – 12% damage up, + DoT if you have “Painful Spasms”. Icy Dart: fragments will do more damage – “Gravitational Perturbation” is active. 30 Cryogen left. At this moment, due to restoration of Cryogen, you should have 40-55 Cryogen. Next step depends on actions of the Boss. 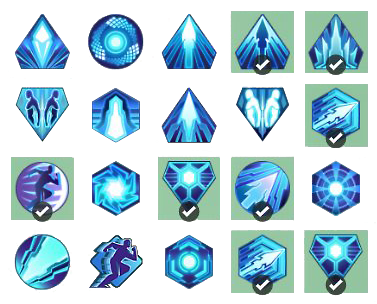 If you are not in danger: Icy Thorn → Shattered Storm → Crystal Shield → Jagged Ice. If you are in danger: Dash → Crystal Shield → Jagged Ice. Cryogen recovery (100+) for 2 Icy Missiles and wait for Impulse recharge. 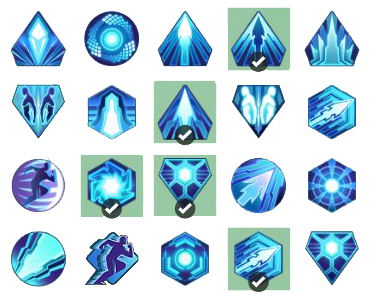 Icy Thorn (Impulse + “Gravitational Perturbation”) → Icy Dart → Cryobeam … Shattered Storm … Crystal Shield → Jagged Ice. Use Icy Dart only after Impulse discharge. It will greatly increase your efficiency. Moreover,Fragments lifetime and Impulse recovery time are close. Try to use Cryobeam and Jagged Ice on cooldown. Keep Whiteout for adds, if you expect them. At the of Whiteout readiness, you should have enough Cryogen for Icy Thorn (Impulse + “Gravitational Perturbation”) and Whiteout itself. Whiteout does 1.5 times more damage per unit of Cryogen than Icy Thorn, if you have “blue” primary (+36%) and secondary (+112%) weapons. Freezing Gale: Impulse + “Gravitational Perturbation”. Icy Beam: stun to target. Icy Thorn: +200% damage and stun, you have Icy Blade. Glacial Fangs: stun to target. Icy Thorn: +200% and stun. This sequence deals approximately 20-25x base damage, + Impulse damage, + Critical damage, +Bonus damage. Nevertheless, abovementioned solution is not universal. Your actions in PvP depend on type of activity, who are your allies and enemies. You should try to keep enemies away, and watch for allies’ actions. If your PvP style is built around Dashes, you need seriously consider Dash-related symbols: Inertia, Rapid Attack, Breakout, Clever Maneuver and Bonus Dash. Practice and gain experience. By saying “stats”, I mean your main (Strength, Valor, Luck and Spirit) and secondary (Accuracy, Temper, Critical Chance…) stats. IMHO, PvE choice is either Strength-Luck, or Valor-Luck. In case of Strength-Luck, you need rings with Accuracy and Critical Chance, in case of Valor-Luck – Temper + Critical Chance. Strength-Valor can be a “special choice” for PvP – in this case you have a chance to kill or nearly kill enemy using only few shots, Accuracy + Temper is your choice. I don’t like any Spirit-related statbuilds. At least, not for Cryo. There is one place, where it can be good: open regions, where you need to clean a lot of packs with weak mobs. Freezing Gale will deal significant damage to the whole pack. Chosen stat-build. If case of Valor-Luck, you don’t need Accuracy Chapels, you need “Mobilization” symbol, and “Ultimate Strength” can be sacrificed easily. Required balance between attack and defense. Selection of Chapels and Symbols for maximum damage. There are several possible selections. Everything below is for Strength-Luck statbuild. Ithanos Archipelago: Discharge Recovery/Shield Power/ Range Damage/Defense penetration. For Provinces with several Chapels choice depends on what is required more at the moment or gives bigger effect. Bold shows my current selection. It also can vary for PvP, for example you can take additional Shield Power in Kesalia or Symerlis. Under Cover of Darkness (Slayer’s symbol). Jinx – Warlock’s symbol looks nice, it is DoT, but the damage is not high, 0.25x base damage every second for 6 seconds. Painful Spasm you can also skip, as well as Impulse Intensity. Shock and Wave paired symbols (2xShock and 2xWave) are nice to have for PvP. Stolen Initiative (Monk’s symbol) is also perfect for Cryo’s stun-tactics in PvP, as well as all Inertia-related symbols. Impact is also “must have” for PvP. In any case, PvP is always a balance between your own damage, ability to survive, ability to control other players and to resist control from their side. This is never straightforward. You can use Painful Spasm, but I recommend to active it only for open regions. If you will take a careful look at symbol’s list, you can see four symbols that increase efficiency of each of 4 primary stats: Impulse Intensity – Spirit, Maximum Recoil – Luck, Ultimate Strength – Strength, and Mobilization – Valor. But, there are only two stat-related DoT symbols: Lacerated Wound – Luck and Painful Spasm – Valor. Two symbols are “missing”. If they will appear in future, than Strength related DoT in must have for Strength-Luck statbuild, and Valor-related for Valor-Luck statbuild. Divine Intervention (Paladin’s symbol). This symbol is “must have”. It will save your life countless times. Shroud of Light (Lightbinder’s symbol). Instant Ice can be considered as a temporary replacement for Divine Intervention. It is less effective, but easier to have – you are Cryo. Actually, discussion on symbols can be a subject of separate guide. There are four types of equipment in this Game. Cryo’s primary weapon is the clearest part. Your primary attack skills are Cryobeam and Icy Missile. Look for the weapon with +damage (18/36/54%) to Cryobeam and Icy Missile. If you have “Founder’s weapon” – it is the best weapon (+54%) at the moment. There are 3 types of Icy Frames. Whiteout deals 56/112/168% more damage. The last one (+168%) is the Founder’s weapon. Crystal Shield reduces control effects by 33/67%. Cryotrap inflicts 56/112/264% more damage. The first two are the most useful. Whiteout offhand for PvE/PvP, and Crystal Shield for PvP. Choice of rings is determined by the chosen statbuild. Nothing to discuss. Amulets are increasing damage of certain skills and always increase your Stamina. There are 4 types of amulets for Cryo. “Green” amulets increase damage of one ability, “blue” and “purple” amulets – of two different abilities. I think increased damage to any abovementioned ability is nice, and therefore I have 16 amulets. Exact choice depends on activity. Shattered Storm and Jagged Ice amulets are nice against solo target. Some people can think thatJagged Ice amulets are better – it has higher damage. But Shattered Storm is the most often used skill. Let’s take a closer look. Figure below is a result of 70 sec fight with some boss. To make experiment as clear as possible, I removed all amulets and switched off all symbols. You can see that Shattered Storm and Jagged Ice have approximately equal parts of the total damage: 12 and 14%. Ideal solution is the amulets with +damage to both skills. But, it is problematic to find them. Finally, it is up to you, what amulet you will take. My personal choice – Shattered Stormamulets, because they are nice for killing small mobs in few clicks. i see you make statistics on a 70 second boss fight. can you tell me which program you are using for such statistics ?